A. Leigh Thornton, Jr., Ph.D.
Katharine (Kitty) B. Fitzhugh, Ph.D.
has over 35 years of experience as a licensed mental health professional. She supports empowering, collaborative approaches to recovery from a mind/body/social perspective. While clients set their goals, she emphasizes the practice of holistic self-care. After becoming a Marriage and Family Therapist in Miami, Florida, she enjoyed working with culturally diverse people as a couples and family therapist and play therapist while completing her doctorate at the University of Miami. 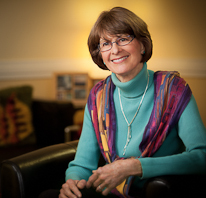 In addition to her role as adjunct professor and graduate student supervisor at the U of M, she began a part time private practice with a specialty in trauma recovery, while facilitating groups of adult sexual abuse survivors and beginning training in clinical hypnosis with the Florida component of the American Society of Clinical Hypnosis. After moving "back home" to Virginia in the late 1990's, she obtained training and experience in working with disabled and geriatric adults in nursing homes, as well as evaluating and treating adults considering bariatric surgery, while continuing ASCH training and furthering her interest in mind/body research and practice. In 2003 she joined the Westwood Group in a general practice of psychotherapy including couples and families. She currently treats adults only. Dr. Fitzhugh supports empowering, collaborative approaches to recovery from a biopsychosocial perspective. While clients set their goals, she emphasizes the practice of holistic self-care. You can make a payment directly to Dr. Fitzhugh below using a credit card or your bank account information. Please turn off pop up blockers for this transaction. If you have any questions about the online payment process, please call our receptionist at 804-264-0966, option 1 for assistance.